I hope that you are all ready to celebrate the blessings (and blessings in disguise) you have been gifted this year and ready to enjoy some yummy food! I’m thankful for many things, too many to name here, but I am looking forward to this holiday season as we celebrate some great big blessings in our family! So, each week when I am coming up with these recipes to share with you all, I try very hard to actually make them, and see how our family likes them. There’s nothing worse than finding a recipe online only to spend the money on the ingredients to find out it is awful. This week is no different. However, the recipe I was making is not what you see here today. You see, I have a dear friend who put together a day where myself and several others got together and put together meals that we could freeze and serve later on down the road. One of those was a dessert that had an option of serving it with whipped cream. I have made whipped cream on several occasions, but this time I didn’t have heavy whipping cream available. I did, however, have a can of sweetened condensed milk. I scoured the inter webs for a way to make whipped cream with this so I didn’t have to run to the store for 1 thing. I found a website that seemed legitimate enough, and went to work. I’ll just save you the time and let you know… Don’t try it. It doesn’t work. At this point, I had added vanilla and confectioner’s sugar to the condensed milk, and I hated to throw it out. That’s when it hit me, a stroke of genius. (These happen every now and again, and when they do, I go with it). I pulled out a can of pumpkin puree from the pantry and added it the mixture. Voila! 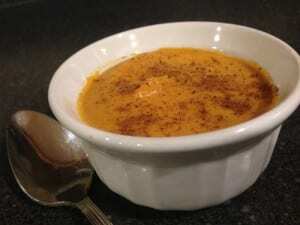 I accidentally made pumpkin pudding (sort of)! After blending it together very well, I put it in the refrigerator to chill overnight. It is very rich, and my husband and I discussed pairing it with a graham cracker crust in a soufflé cup for an individual dessert, but it taste really good. Needless to say, I still had to go to the store to get whipped cream, but I got this accidental pumpkin pudding out of it. I’d say that is a win in my book. What are some ways you would have saved this accident? Have a blast this week with family and friends celebrating Thanksgiving with one another. 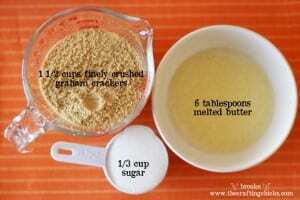 Mix all ingredients together and place in graham cracker crusts. Refrigerate overnight to all it to chill.